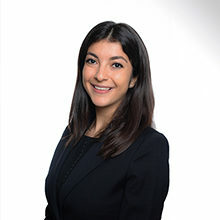 Sarah Azoulay joined LALIVE in 2018 as a trainee. Before joining the firm, Sarah Azoulay trained at a leading law firm in Zurich. During her studies, she worked for several law firms, for an international bank in Zurich and completed an internship at a district court in Zurich. Sarah Azoulay holds a Bachelor of Law (2015) and a Master of Law (2017) from the University of Zurich.